All of our images are "judged in the blind", the photographers names are not disclosed to the judging panel. We also host Special Guest Judges that are the sole judge of a specific competition theme of their choice where we tailor the competition to support their personal vision and ideas. Philippe Sainte-Laudy is an amazing nature and landscape Photographer who currently lives near Strasbourg, France. 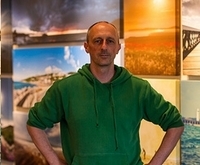 His work has been featured in various publications worldwide, including The Environmentalist, Computer Art, Geo Magazine and The Outdoor Photographer. "My goal in the world of photography is to strive for originality, and create my images into an art-form. My passion is landscape and nature photography but I also love optimizing and working with images in Photoshop, Aperture and Lightroom. I hope that photography can bring people closer to nature and encourage them to preserve it for future generations." Philippe offers some wonderful Photography Tutorials Online and also runs Blost, a Web development company specializing in small to medium enterprise business sites. Dawna became interested in photography began when she was very young and shooting with a Fischer Price 110 film camera. "During family events and gatherings, I was always the one behind the lens capturing the moment, but I never really learned how my camera worked or the art of photography. After a trip to Europe in 2008, where all of my photos came out horrible, I decided to learn the skills needed to capture beautiful images. I have been on the journey ever since and loving every minute of it! " "I graduated from the New York Institute of Photography in 2012, earning a certificate in Professional Photography. I am also a member of the North American Nature Photographers Association (NANPA) and a board member for Wild Amelia and my local co-op art gallery, Island Art Association. My love of travel, history and nature are a constant source of photographic adventures. State and national parks always top my list of places to visit. I also have a love for all things European and enjoy studying the Continent’s history and culture." James is an amazing photographer who has experimented with all types of photography but enjoys nature and night photography the most. He also runs a fantastic Commercial Photography Company, Corporate-Exposures, LLC working out of Atlanta, Georgia. "Photography is a creative outlet for me and a way to share my experiences with family and friends. I first learned photography from my father who worked his entire life as a professional photographer. He is now my inspiration. Kimberly, my wife, says he is smiling down at me from heaven." Working from the Isle of Wight, Jason has been around a while, he existed in the days before the internet, digital cameras, and the only photos he took back then were to be used a reference, to gather ideas and colours and compositions for what was his real passion as an artist, or a 'painter'. "It wasn't until traveling in South America and specifically Peru that I first realised I had begun to enjoy photography in its own right, and begun to take photos that had some artistic merit of their own. Shooting dramatic Isle of Wight coastal landscapes and developing my own style for ultra-wide 'vertoramas' (vertical panoramas) that placed the emphasis on the sky and clouds dwarfing the world below, or finding some synchronicity between the two elements with leading lines tying them together. I found myself able to create images that finally satisfied me, and with the growth of social media and my flickr persona s0ulsurfing in particular, a platform to share them on and talk about photographic techniques in a community of like-minded individuals. Lately I've been evolving these vertoramas by adding the dimension of time, and shooting long exposures. With this added element in addition to an ever-changing coastline and constantly changing weather, there's no lack of inspirational scenes to photograph." Wayne Moran is a Minnesota based photographer and artist greatly influenced by the Upper Midwest. "I focus my skills and energies on landscapes, cityscapes, architectural, fine art and portrait work. "My style of capturing photographs has not happened on purpose. It has been a process of discovering what my natural passions and inclinations are when it comes to capturing beauty. My best work comes from images first painted in my mind. I mull over a prospective image for weeks or months, seeing it from different angles and perspectives, then finally deciding what to capture, I take action. The result is images that deeply touch a person’s emotions and powerfully evoke memories and dreams." Michael Spicer is an Environmental Fine Art Photographer and his wonderful work encompasses portraits, landscapes, and environmental abstracts taken during his travels across the United States and around the world in over 25 countries. Michael offers some wonderful workshops in Northeast Florida, his Amelia Island Photography Workshops which are scheduled throughout the year and can also be arranged for small groups while visiting Amelia Island. "I have been interested in photography for most of my life. The interplay of light and shadows has always attracted my attention and I enjoy using the tools of photography to help me create interpretations of the mood I feel as I visit places or interact with people around the world. As an environmental fine art photographer, my passion is to capture the light that shines and reflects on the beauty of the world around us. Rather than attempting to make any political statement about the environment through my work, I am called to define where we live by the beauty that surrounds us, not always seen by the casual observer, but there no less." Stephan R. Leimberg was the 2008 International Nikon - Popular Photography Mentor Series Grand Prize Winner. He is an exhibiting member of the Amelia Island Art Association and the Omni Plantation Guild and Gallery located in Northeast Florida. He’s created portraits of ACT notables Sinda Nichols, Ron Kurtz, Graham Thomas and Linda McClane , a book cover for poet/author Nola Perez and his portrait of author Pat Conroy (Price of Tides, The Great Santini) is the inner back fly-cover for Conroy’s book, My Life In Reading. Known as The "BirdMan of Amelia" , Steve is acclaimed for his stunning painting-like prints of birds and other Amelia Island wildlife. Eric Rousset is a landscape photographer based in the south of France. Passionate about photography for more than 10 years, he has been able throughout these years to diversify into landscape photography. Through his travels he has been able to bring his share of photographic creativity, and constantly improve his artistic work in post-production. Sharing his world through conferences on exhibitions & photo festivals. His work has been published in several French and international photo magazines. Ambassador of the NiSi brand since 2015, and co-founder of the NiSi France website in 2016.